Elvis Presley's Graceland has announced the acquisition of one of the most significant pieces of Elvis’ musical history, which will be returned to Graceland 60 years after it was first purchased by Elvis for the home in 1957 – a white, baby grand piano with gold accents and a custom-made, gold, metal bench designed by Elvis with a white, leather cushion. 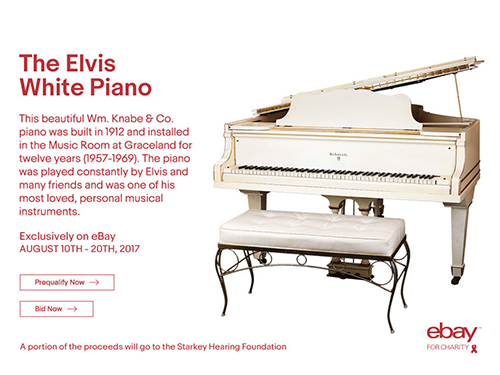 For the first time ever, the public will be able to see this legendary Knabe branded piano on display in its Graceland home. The music room at Graceland will be restored to its original 1960s-era appearance including the white piano, and will be unveiled on December 16, 2017. Other items returning to the famous music room include original white and blue draperies, and a gold couch that was part of the room’s décor in 1964. The white piano is the most significant piece of original furnishings to come home to Graceland since the Mansion opened for tours in 1982. Have to give Priscilla and EPE a round of applause for this one. A very sentimental piano back where it should be. Will she go for the gold piano next?